This tour starts at 9:00 a.m. and is held within the city of Huaraz. The tour begins in the main square where we learn some of the history of the area. We then travel by vehicle to the main church of the city, Soledad. From there we will go to Jose Olaya, the oldest street in Huaraz, which survived the earthquake of 1970. From there we will visit the trout farm, where we will learn about trout raised and sold to the local markets and restaurants. 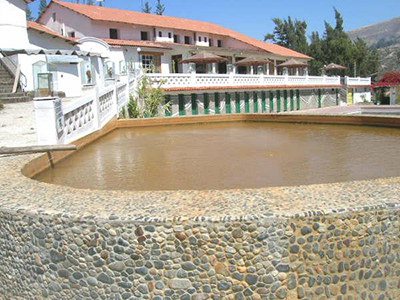 From there we head to the Monterrey Hot Spring, which is located seven kilometers from central Huaraz in Monterrey. There we will bathe in the medicinal warm waters, which re reputed to cure arthritis, respiratory diseases, and other conditions. After this relaxing bath, we will enjoy a tasty traditional lunch. Then we board our bus back to the city of Huaraz.